Posted this earlier but I don't know what happened to the post. Seems to have disappeared. 2018. They lent an epic feeling to a hero entry and made it feel more like a major event as opposed to the current state, which is a bit underwhelming. 2. Holograms have been removed from the main menu and UI, but there's one place where they could (and should) make a comeback. 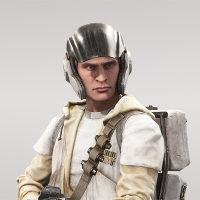 One of the things that I loved from the Survival Modes in BF2015 was the way Admiral Ackbar sent the player a hologram of which stormtroopers were coming in the next wave. This should be implemented into Galactic Assault (and Conquest). How? These are little things that would increase the QoL and immersion factors. Posted on this one before, but I think they are all good ideas! Especially the Hero announcements and hologram effect. It's weird that no one knows who is entering the field. At least announce the name for correct era Heroes. I hope these changes get a look by the team. There are various random audio and visual issues, the black loading screen, the weekly challenge and probably more.